My family know me well. Whenever they travel anywhere or return back to Australia, presents are always in the form of food. It gives me the greatest thrill to unwrap a box of curated items from a particular place. My mum lives in Queensland and on her last visit to Melbourne carted with her a whole tray of mangoes, dried local fruits and sugar! Of course I could have bought this things here in Melbourne, but the days after my mum left, we began to slowly eat the treasures and she seemed a little closer again. My sister who visited from New York brought us coffee, babka, poppyseed crackers and a whole host of Dominican treats from her local Bodega. She's just moved to Paris and recently visited Lisbon – I hear there are a box of sardines on their way to me. What does this all have to do with a jam crostata? Yesterday as Haruki was napping, I was fossicking around the cupboards, looking for inspiration for a dessert. There was an unopened jar of apricot jam towards the back, in between the sugars and the jars of pulses. I couldn't recall buying it, but I am very partial to apricot jam, in fact I would say that it is my favourite. 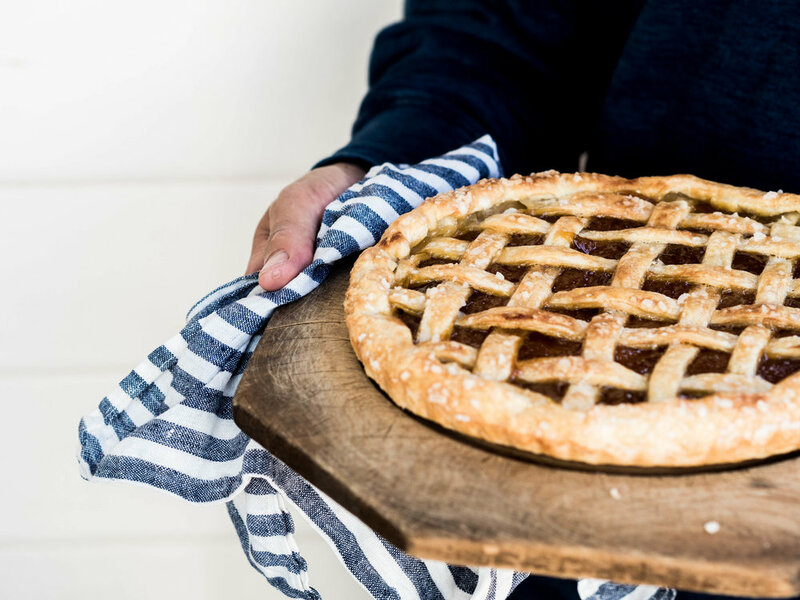 Immediately I visualised a latticed jam crostata, like the ones you would eat for breakfast in Italy – oozy, crispy and definitely achievable. The jam was from my mum. Homemade jam is best for this recipe, and you can use any flavour. Of course store-bought will work too. Often the pastry is almost cake-like, I however prefer it more flaky. To make the pastry, tip the flour onto a clean work surface and sprinkle with the salt. Add the butter and toss through the flour. Using a metal pastry scraper or a knife, cut the butter into the flour until the mixture resembles coarse breadcrumbs. There should be larger pieces of butter too, so don’t overwork it at this stage. Pour the egg onto the mixture and incorporate into the dough using the pastry scraper or knife. Once all the egg has been gently mixed in, begin to sprinkle with iced water, one tablespoon at a time, until the dough just comes together, using your hands or a pastry scraper to bring it all together to form the pastry. I find I usually need around 50 ml, but just go by how the pastry feels – some flours need more or less water.It still should be a little shaggy with visible pieces of butter. Shape the pastry into a flattish disc, cover with a damp cloth or plastic wrap and refrigerate for at least 30 minutes. Remove the pastry from the fridge, and if very firm, allow to warm up at room temperature, just for 5 or so minutes. This is to prevent the pastry cracking at the edges as you roll it out. Take 3/4 of the dough and roll out on a lightly floured surface until 3mm in thickness. Drape the pastry into a 24cm round loose-bottomed fluted tart pan, allowing plenty of pastry to hang over the edges. Roll out the remaining dough to the same thickness and using a pastry cutter or knife, cut strips of pastry approximately 1cm wide. Set aside. 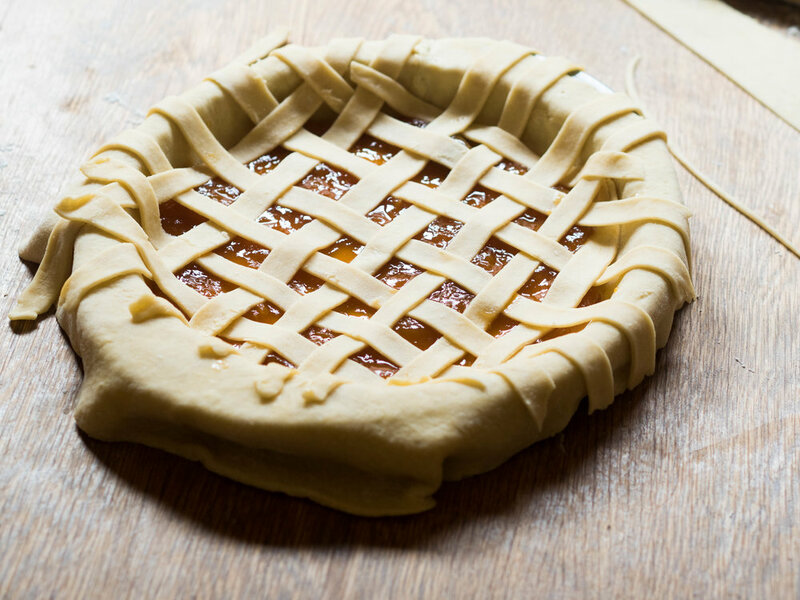 Spoon the jam onto the base of the pastry then create a lattice pattern with the previously cut strips of pastry. Trim the overhanging pastry, leaving a 2cm border. Fold the overhanging pastry into the tart, and pinch to secure. Carefully brush the pastry with cream and scatter with pearl sugar. Bake in the preheated oven for 25-30 minutes until golden. Allow to cool.